It goes on to list the seven unique times of the year when the Most High meets with His people. These are His times, not those of the world. They are neither Jewish nor Christian, but belong to the Creator, and He has called us to join with Him in celebrating them. It doesn't matter your denomination or sect - the King has extended His hand to request your presence with Him during these spiritual events that bleed through into time and space. They are of greater significance than any day or anniversary man could create. These days are the most important times in the whole world, where the calendars of the kingdoms of the earth have opportunity to sync up with the calendar of the Kingdom of Heaven. It is as if mundane time were made to give honor to these special meetings – we live all year just to be a part of these spiritually-significant moments! When one looks at the Appointed Times listed in Leviticus 23, it becomes clear that they are divided into two groups: those occurring during the “spring-time,” and those occurring during the “fall.” They are thus often referred to by many in the faith as Spring Feasts and Fall Feasts. Looking at the life of the Messiah, we see that He filled-up the meaning of the Spring Feasts in His first coming, dying on the Appointed Time of Passover, rising on the Appointed Time day of the Wave Offering of Firstfruits, and sending His Holy Spirit on the Appointed Time of Weeks. Looking at the Fall Feasts, we don’t see any direct fulfillments of them by Messiah during His ministry in Israel. Rather, He has ascended to the right of the Father far above the heavens, and is awaiting His return to complete His ministry in the holy land. That means we are left to await the fulfillment of the Fall Feasts by the Messiah! The beginning of these Fall Feasts is called in Hebrew Yom T’ruah, which is widely called “The Day of Trumpets,” but truly means “The Day of the Blast.” The term T’RUAH is firstly and almost exclusively used in the Hebrew Scriptures to refer to the sound of the trumpet / ram’s horn, which is why the first Appointed Time of the fall holy days is typically referred to as the “Day of Trumpets.” This special day is spoken of in an interesting way in the book of Psalms 89:16. Prosperous are the people knowing the blast [of the ram’s horn]; YHWH, in the light of Your face they shall walk. The text tells us that we are blessed to know the blast (of the trumpet) of the Most High. What is so significant about knowing that sound that one should receive a blessing by being familiar with it? To understand that declaration of Scripture, we need to appreciate the Appointed Time of Yom T’ruah as it is discussed in the Word. It is unique among the rest of the Appointed Times, because it is the only one which is set on the first day of a month. The rest fall on a determined day of the month, but Yom T’ruah can only begin with the coming of the new moon. The exact, precise moment the moon becomes “new” is never known by naked-eye observers on earth, which meant the proclamation of the Appointed Time was particularly unique. It is also of great significance, because of all the Appointed Times, it alone is not given a reason to be performed, yet it is specifically called a “memorial” in the book of Leviticus 23:24. "Speak to the sons of Yisra'El, to say, 'In the seventh month, on the first of the month, there shall be for you a rest, a memorial of blasting, a holy gathering.'" Do you understand why that is important? The word usually translated as “memorial” is ZEEKRON, and simply means “to remember.” This day is thus a day we are to make a “blast,” as the word T'RUAH means, with a ram’s horn, in order to remember. Just what are we to remember, exactly? There is nothing in the Torah which explains what it is that we are observing this day in order to remember!! Orthodox Judaism has arrived at a “memorial” through their tradition, taking the letters of the first word of Scripture B’REYSHEETH "In the beginning," rearranging them, and forming the phrase ALEF B’TEESHREE, meaning “On the first of Tishri,” which would be the first day of the seventh month of the Hebrew calendar, and have thus concluded that this “memorial” commemorates the creation of the world, and so it is seen as the beginning of a new year. It is my position that anagrams cannot define a doctrinal truth for us – that is just my opinion. There must be a more substantial reason for it commemorating an actual event. Now think about this for a moment – we’re told to “blast” / “blow a ram’s horn” for a remembrance of something, yet there is nothing to base this memory upon in Torah! Nothing happened historically in Scripture on Yom T’ruah to give us anything to remember! We’re remembering something that never happened in our past! How strange is that? Just what is going on? But wait; what if we can remember something that will happen in our future? Is that even possible? How can you remember something that hasn't even occurred yet? With the Holy One, this is entirely possible, for we see glimpses of what is to come through the Spirit speaking to the prophets, showing us scenes of the last days and the days of the Messiah. Those words preserved for us give us something to remember: the future! Therefore, we stand now between the fulfillments of the Most High’s Appointed Times: we look back and remember the Spring Feasts – those fulfilled by the Messiah – indeed, Passover itself is called a ZEEKRON, a “remembrance,” and is the first of the Spring feasts, and the only other one besides Yom T’ruah – the first of the Fall feasts, to be called a “remembrance.” We stand in time, looking back to the Spring Feasts, and then forward, to the Fall Feasts, remembering what has happened in the spring, and remembering what will happen in the fall! In meeting with Him at His Appointed Times, we are safely stepping outside of time and seeing things from His perspective, not ours! If there is nothing in the historical record of Scripture to explain to us what we are remembering, we can only go into the prophecies of a time yet to be fulfilled, and hope to see what it is that we are remembering that hasn’t happened yet. It is obviously very important for us to understand, or else this day would not be stated as a “memorial.” The Most High does not want us to forget what has not yet occurred! We thus go into the Prophets and see what waits for us in time to come! What better prophet to begin our search than Zechariah, whose name in Hebrew - ZEKARYAH means “Yah Remembers!” That is the point we need to stress: YAH REMEMBERS! What has happened – Yah remembers. What is yet to be – Yah remembers. When we align with Him, we go by His timing, and so things can get a little strange, but they usually level out (usually), so let’s hang on and see what it is that He has remembered for us in this book that records events which have mostly not happened to us - yet: Zechariah 9:14. And YHWH shall be seen over them, and His arrow shall go forth as lightning; and the Master YHWH with a shofar shall blast, and shall go with storms of the south. Here we see that the blowing of the ram’s horn, the blast of it, shall signal the appearance of the Master with an arrow like lightning. This is important. The word for “arrow” is KHEYTZ, and literally means “To Divide.” We know that on Yom T’ruah He gathers His chosen ones, so a division is going to be made on that day! The text also says that He shall walk with “storms” – which is the same Hebrew term SA’AR used when it speaks of the prophet Elijah being taken away into heaven by a tornado; in fact, in that instance, it is the first time the word is ever used (2nd Kings 2:1)! 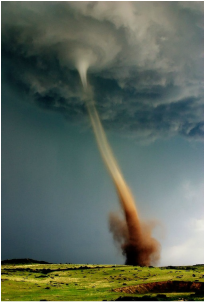 The power of the tornado is that it pulls things up, lifting them from the earth. It symbolizes our being gathered to Him at His coming! At Yom T'ruah we remember that the ram’s horn signals His coming, and it will have something particularly to do with division / lifting up. If that is true, then it only follows that His coming would be the Day of YHWH. We can see the fulfillment of this being at Messiah’s return: Matthew 24:27, 31. ​27 For as it is that the lightning comes forth from the east and is seen even unto the west, thus shall be the coming of the Son of Man. 31 And He shall send His messengers with a great ram’s horn, and they shall gather His own selected ones from the four winds, from one start of the heavens until [another] start. His coming at the sound of the ram’s horn shall instigate His angels to personally find and accompany us in the air to Him in the sky. Here it likens His coming to the immediacy of lightning striking, which is to say that the division/selection of the chosen shall be instantly implemented. This selection will be a powerful witness for all who look on as we are taken into the sky! The book of the prophet Joel 2:1-2, continues the important information about a day we shall remember. Sound a ram’s horn in Tzeeyon, and blast it in My Set-Apart Mountain; let tremble all the inhabitants of the earth, for the day of YHWH comes, for it is near! A day of darkness and gloominess, a day of cloud and thick darkness, like twilight spread upon the mountains; a people great and strong, the like of them has not been from eternity, and after them shall be no more, until the years of generations and generations. This passage shows that the ram’s horn sounding in Zion signals the day of YHWH, as expected, and although it is a terrifying day, it is a day in which an eternal change is made in His people – we who were perishing before His coming are gifted a new body that man has never known before. We remember that His coming will transform us into a powerful people – finally to live forever as a light to the nations. It is with the second coming and the sound of the ram’s horn that everything changes, as we see elsewhere: Isaiah 27:13. 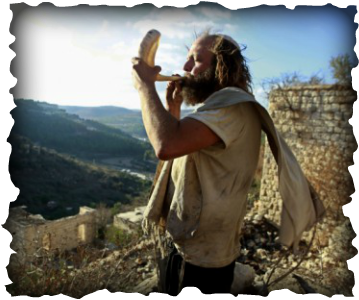 And it shall be in that very day there shall be a blast with a great shofar, and they shall come who were failing in the land of Ashshur, and the exiled in the land of Mitzrayim, and they shall bow down to YHWH on the holy mountain at Yerushalayim. ​The ram’s horn blowing will summon the languishing believers scattered abroad unto the holy city of Jerusalem! We remember that the ram’s horn signals the gathering of Israel to go to Jerusalem and the Set-Apart Mountain. This gathering is to the camp of the Most High, His tribes ending up in His city! ​In the book of Exodus 19:13, the people could only ascend the mountain when the sound of the ram’s horn was heard. They could not ascend to Him at any point in time, but only when the ram’s horn sounded in their ears. This factor shows us that the same will be true in our ascension to Him in the skies at His Appointed Time of Yom T'ruah. We see the fulfillment of this being at Messiah’s return to invade and overtake this world as His Kingdom in 1st Corinthians 15:51-53. 52 rapidly, at an eye’s blink, at the final ram’s horn, when it shall call, and the dead shall be raised without corruption, and we shall be changed. 53 For it is prepared that this that is corruptible, that it shall wear incorruptibility, and this that dies, that it shall wear immortality. This awesome change reworks our sin-scarred DNA to be restored in purity, to be united in Spirit and flesh with no barriers between. The future Yom T'ruah that we await will enact in us a long-sought for covenantal promise: we will be able to stand in His midst as a people with no blemish of sin separating us, no mortal limits preventing us from remaining in the awe of His Presence! The moment will bring about a transformation in the earth: His Kingdom citizens will be markedly made known among the rest of the world! It is a moment mentioned again in 1st Thessalonians 4:14-17. The sheer magnitude of what shall transpire can be discussed, but to experience it shall be more than we can now imagine! 14 For if we trust that Yeshua died and was raised, thus even them that have slept in Yeshua shall the Deity bring with Him. 15 But this we say to you by the word of our Master: that we who remain at the coming of our Master, who are alive, shall not overtake those that have slept. 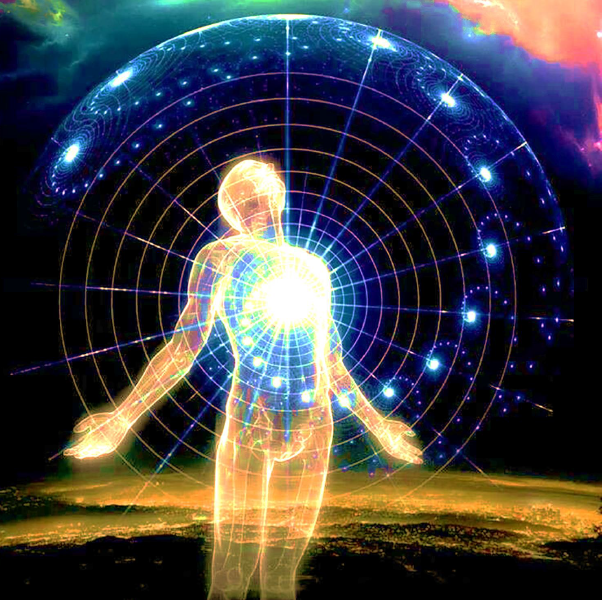 17 and afterwards those who remain – we who are living – we shall be grasped-hold-of with them together in the clouds, to the meeting of our Master in the air, and thus at all times we shall be with our Master. Messiah returns to earth to dwell with man, and brings a change in us, transforming His people into a glorified people, and this happens at the time of the last trumpet! At His coming to assume reigns of the Kingdoms of the earth, we who are citizens of heaven on earth now will be given the reward for our faith - everlasting bodies that are able to draw near to Him. 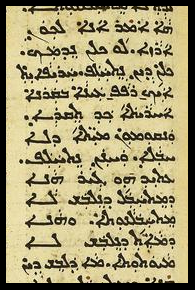 Notice in verse 16 that it says He returns with “the commandments.” This phrase, taken literally from the Aramaic New Testament text of the Peshitta, has been mistranslated into Greek as “shout / proclamation,” due to a misunderstanding of the Aramaic term PUQDANA, but the Aramaic clearly is the word for “commandment” that is used throughout the Torah in its Aramaic translation, as well as by Messiah in the Aramaic text of the New Covenant! He is returning with the Word in His mouth, like a sword, and will sit in Jerusalem teaching it, for from Zion goes forth Torah in the Messianic Kingdom! He returns with "the commandments," because embedded in them is the promise of life (salvation), as Deuteronomy 30:11-15 explains that life is for those who obey His commandments. This return with the commandments means that He makes good on the promise of life - eternal life in a body restored from sin to purity in flesh and spirit. The importance of us paying attention to the blast of the ram’s horn is made clear for us furthermore in the book of Isaiah 18:3. It is not a time to ignore, but rather, observing Yom T’ruah allows us to train our ears for His coming! All you inhabitants of the world and inhabitants of the land, when a banner is raised on the mountains – look, and when a ram’s horn sounds, do listen! The text tells us to pay attention to the sound of a ram’s horn, for it signals also the appearance of a banner. This detail is important to catch and understand. We remember that the ram’s horn is linked to a banner. The banner was often used as a rallying-point for war: the soldiers would be fighting and would know where their camp was located; it was where hope existed of victory. This concept is further elaborated upon in Isaiah 11:10 and 12. 10 And in that day there shall be a Root of Yeeshai, who stands for a banner of the peoples, to Him the Gentiles do seek, and His resting place shall be glorious. ​12 And He shall raise a banner for the gentiles, and shall gather the outcasts of Yisra’El, and shall assemble the dispersed of Y’hudah from the four corners of the earth. It is declared in this verse what this banner truly entails: the Root of Jesse – the Messiah Yeshua!!! He stands as a banner for the Gentiles and to gather the outcasts of Israel and the dispersed of Judah; this means that He will summon all those blessed by Abraham through Messiah: Hebrew and Gentile alike, lost and found the same! He is the “banner” to which we shall assemble as a harmonized body upon the Day of YHWH! We see the fulfillment of this being at Messiah’s return, as detailed in the book of Matthew 24:29-30. ​29 And immediately after the affliction of those days, the sun shall be darkened, and the moon shall not show its light, and the stars shall fall from the heavens, and the powers of the heavens shall be shaken. 30 And then shall be seen the banner of the Son of Man in the heavens, and then shall mourn all the tribes of the land, and they shall see the Son of Man who comes upon heaven’s clouds with power and great glory. This is extremely significant, for it links the thoughts from the Hebrew Scriptures to the New Covenant seamlessly! Notice how it mentions that the tribes shall mourn upon seeing the banner? Why would the tribes mourn upon looking at His banner? The answer is found in the Word’s original statement of the placement of the tribes in the wilderness, recorded for us in Numbers 2:3. And at the east, from the sunrise, shall abide the banner of the camp of Y’hudah, for their armies, and the leader for the sons of Y’hudah is Nakh’shon, son of Ameenadav. This detail from the Torah tells us that the tribe of Judah’s banner would be set up on the eastern side of the encampments in the wilderness, towards the rising of the sun! When we take this factor and apply it to the second coming of Yeshua, we see that Messiah, who is of the tribe of Judah, comes to Jerusalem from the east, just as the placement of the tribe and its banner was east of the Tabernacle in the wilderness, and the Aramaic says that He comes in this way with a banner! This information illuminates for us the “sign” which we await to see – it will be the banner for the camp of Judah that shall be flown in the sky with Him, and to which all believers shall be gathered at the shout of the ram’s horn! The tribes mourn when this sight is seen, because they will know for certain at last the identity of the Hope they have carried, and yet spurned, for so long. It doesn't stop there, however, as a curious piece of information is also given elsewhere that seems to point to an additional detail in this banner signal that is entirely worth our attention. In the book of Revelation 19:16, we’re told that Yeshua returns, and upon His thigh / leg is written “King of Kings and Master of Masters.” The book of Revelation, unlike any other book of the New Covenant, seems to have originally been penned in the Hebrew tongue, for the Greek text is marred with truly atypical grammar and syntax that is entirely consonant with the way Hebrew is written. It can be read so easily when reverted in grammar back into Hebrew! This reality of the condition of the Greek makes it seem plausible that it was merely translated from a Hebrew source rather clumsily by the hand of a scribe who did not know Greek sufficiently enough to render a flowing result. That said, it is possible that the term “thigh / leg” found in the Greek could be a misreading if originally taken from Hebrew, for a word that can be translated as “thigh / “leg” in Hebrew is RAGEL. It is most often meant as “foot,” but “thigh / leg” is also contested-to in the Word as a valid description. 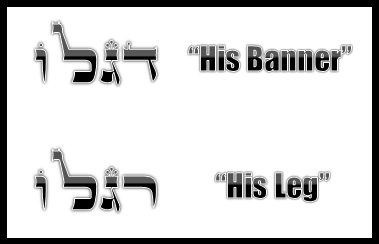 Therefore, if it originally was penned in Hebrew, it could have read DEEGLO, meaning “his banner,” instead of RAGLO – “his thigh.” The theoretical confusion between the letter Dalet and the Resh here is actually one that can be found in scattered instances in the Hebrew text, as in Genesis 10:4 and 1st Chronicles 1:7, where the individual’s name is Dodaneem in the former, and Rodaneem in the latter. There are other examples, but this simple one suffices to show the exact equivalent of such a mistake, and how easy it was for a scribe to misread the two letters. Of course, this is just a possibility that would only serve to be a third witness to the idea of a banner being linked with Messiah’s return. One must be careful to say that a misreading has survived in the text of Scripture without probable reason. The strange idea that He returns with such a phrase written on His thigh / leg, coupled with the great ease in which the letter Resh and the letter Dalet can be confused - even by scribes - however, and the resulting translation that appears if such were the case, makes the mention of the possibility worthy to consider and meditate upon. Either way, the Messiah / banner link is firmly established by other verses shown above. This would merely bolster the idea. Understanding these few key points about a future Yom T’ruah, we can now see that the picture developing in our memory is of the return of the Messiah and our gathering together to meet Him and take part in the reclamation of the world! What an awesome memory to be given in advance! The Most High is so good that He gives us memorials to keep for what shall one day come to pass! He makes sure we remember in advance those things that we shall be a part of in His plan! He knows what is in store for us, and will even give us the memories to keep us occupied and hopeful until we get to experience them for the first time! We are rehearsing now the memory of the coming of His Son in the Appointed Time of Yom T’ruah, but we shall one day live it for the first time! His Appointed Times in Scripture are the true timepieces of reality – they are the key points in the timeline of human interaction with the Divine that we must seek to find ourselves in harmony. They are the clockworks of the Kingdom, the timepieces of eternity! With the Holy One, the future is as true and real as the past, and so when we come to be with Him on His Appointed Times, we have the opportunity to observe one of His special times that has not yet happened to us in the present, but has already happened to us in the future! On Yom T’ruah, we who hear the sound of the ram’s horn are blessed by having a time to remember the future! Messiah is coming! !